Herewith is my submission made at the oral hearing in respect of this planning application, March 26th 2019. 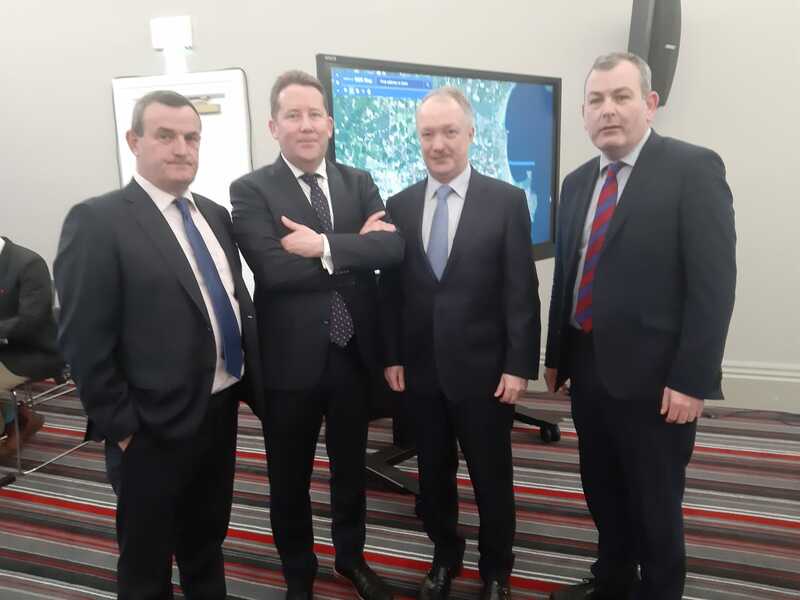 Presentation by Seán Haughey TD to the An Bord Pleanála oral hearing in respect of the planning application by Irish Water for the Greater Dublin Drainage Project, plan number ABP 301908-18, March 26th 2019. I’m Seán Haughey and I am a TD for the constituency of Dublin Bay North. I was first elected to Dublin City Council 34 years ago in 1985 for the Clonshaugh area and have represented Clonshaugh on and off ever since as a Dublin City Councillor and a Dáil Deputy. As it happens, I live close to the proposed site for the treatment plant. It is just a few fields away from my house and I pass the site every day so I am very familiar with the location in question. But I am here today representing my constituents who live in Clonshaugh and the surrounding areas including Newbury, Swift’s Grove, Belcamp, Priorswood, Darndale, Coolock, Cara Park and Northern Cross, as well as constituents living further afield in Clarehall, Clongriffin, and Belmayne, and not forgetting constituents residing in the coastal communities of Baldoyle, Sutton, and Howth. In my submission today I will be putting forward the view that the site chosen for the waste water treatment plant is unsuitable and I will speak on planning application ABP – 301908-18. I will also outline my concerns in relation to the outfall pipeline and and the affect this will have on the UNESCO Dublin Bay Biosphere. On August 14th 2018 I made a joint written submission with my colleague and local Councillor, Seán Paul Mahon, objecting to this planning application and I will expand on this written observation during the course of this presentation. I have read all the documentation which accompanied the planning application and have carefully followed the proceedings of this oral hearing. Much of the evidence given to the oral hearing to date is very technical in nature and I don’t profess to be an expert on these matters. However, I wish to state as a layman I have not received the assurances that I need in relation to various aspects of this project. One of my main concerns in relation to this proposed development relates to the sheer size of the treatment plant. The site required is 30 hectares which is 4 times the size of Croke Park. Initially, Fingal County Council examined 22 proposed sites for the treatment plant and this was whittled down to 12 sites and then to 9 parcels of land. Newtown Corduff – 2.2km west of Lusk. Cloghran and Clonshaugh – with a marine outfall between Malahide and Portmarnock. Some of these sites may be suitable for the proposed waste water treatment plant but the one at Clonshaugh certainly is not. It is beside densely populated areas and will seriously injure the residential amenities of householders living in this locality. In my view there have been serious planning failures in respect of this area down through the years. Local residents have endured many inconveniences as a result. Aeroplanes at Dublin Airport taking off and landing by using the main East-West runway are a cause of serious noise and disturbance for local residents most of the time. Dublin City Council/Fingal County Council and An Bord Pleanála have granted planning permission for an aviation fuel pipeline under the R139 (formerly the N32) and Stockhole Lane/Old Clonshaugh Road which border this site, planning reference number PL 29N.245738. Fingal County Council deemed it appropriate to construct a housing scheme for travellers on the extreme fringe of its administrate area to the north of the site leaving the new residents there in a very isolated location. An illegal dump has been discovered in recent years in a field immediately north of the R139. Stokehole Lane/Old Clonshaugh Road is now a dumping black spot and bags of rubbish are routinely discarded on this road on a daily basis. There is a general view in the local community that this waste water treatment plant is also being dumped on them. We will probably never know all the reasons why this site was ultimately chosen but the suspicion is that political considerations were taken into account. The site is to the extreme north fringe of the administrative area of Dublin City Council and the extreme south fringe of the administrative area of Fingal County Council. No desirable development will now be possible in this hinterland if this project is sanctioned. The main worry for residents living in this area is in respect of possible odour. Local residents, including myself, very often wake up in the morning to the beautiful smell of coffee emanating from Beweley’s at Northern Cross depending on which way the wind is blowing. Similarly, the smell of aviation fuel coming from Dublin Airport can also be detected when the wind comes from a certain direction. There is an acute awareness of the foul smell experienced by residents living in the Ringsend area as a result of the operation of the Ringsend plant. Dan O’Boyle told this oral hearing that a buffer zone around odour producing units had been increased from 100 meters to 300 meters and that treatment tanks would be fully covered as part of the odour management plan. It is interesting to note that these additional measures were only brought forward as a result of local concerns and that they were not initially put forward as part of the original application. The real fear is that these new mitigation measures will not be effective and that the assurances given are not credible. Seán Laffoy from Irish Water has informed the hearing that a new single plant is preferred to multiple smaller sites because it has more benefits in terms of odour control, sludge treatment, and energy recovery. I wonder about this. I believe that this position needs to be robustly challenged as it seems to me that it goes against sustainable environmental principles. In addition, the consequences of an accident occurring in such a large treatment plant would clearly have much more serious consequences than systems failures in smaller plants. As already mentioned, residents in this neighbourhood already have to put up with serious aircraft noise. In addition to this they are subjected to ongoing noise from traffic. The operation of this plant will generate additional noise and I do not believe that this has been adequately catered for in the planning application. The proposed plant will be up to 18 meters high. This is visually obtrusive and will injure the residential amenities of householders living adjacent to the site. I have major concerns about the impact this development will have on traffic flows in the area during the construction phase and if and when it is operational. The R139 which leads on from the M50 is badly congested at the best of times. The roundabouts at (1) M50/M1/R139, (2) R139/Stockhole Lane/Old Clonshaugh Road and (3) Clonshaugh Road/R139 can be very difficult to negotiate due to heavy volumes of traffic. In my view the existing road infrastructure is inadequate to deal with this proposed large scale development and severe traffic disruption is inevitable should it be approved. Ciaráin O’Keeffe from Irish Water has told the oral hearing that it will now apply UV treatment to all effluent discharges. Again, I am not an expert, but wonder if this is in fact tertiary treatment that is being proposed at this stage. It is also interesting to note that this proposed Ultra-Violet disinfectant treatment was not suggested as part of the initial application and the fact that this measure is only being brought forward at this late stage does not inspire confidence. My major concern regarding this proposed development is in respect to the threat it proposes to the marine environment. 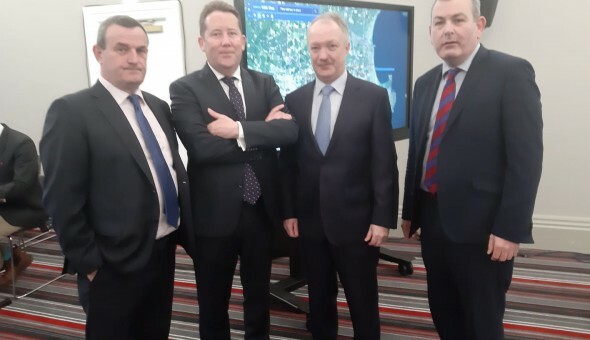 A 12km outfall pipeline is proposed from Clonshaugh to Baldoyle and out to sea for discharge around 1km east of Ireland’s Eye. We are told that this proposal will have a negligible impact on the quality of coastal water. I find that hard to believe. The Velvet Strand at Portmarnock has Blue Flag status. I use this beach regularly and watched in dismay in recent years as a platform looking very much like an oil rig conducted surveys for Irish Water off Ireland’s Eye. The effect of the discharge into the sea needs to be examined in the context of the normal operation of the plant but also in the context of a systems failure or accident at the plant. In September 2018 An Bord Pleanála refused planning permission for 500 homes at the playing fields of St. Paul’s College, Raheny, at St. Anne’s Park. It had initially granted permission for the housing development but then refused it following a Judicial Review, plan number ABP-300559-18. The application was refused having considered legal points raised in respect of European Environmental Directives, specifically relating to the potential impact on bird species including the Brent geese (incidentally, Brent geese have been photographed feeding on the site of the proposed plant and these photographs have been submitted with other third party observations). UNESCO Biosphere – Dublin Bay and North Bull Island. The threat to bathers as well as the threat to shellfish fishing grounds are very real. I would argue that this proposed development contravenes European law and can be rejected on these grounds alone. Essentially, at the end of the day we are down to a question of trust. When I started off in politics I respected authority and trusted institutions. I am long enough in politics to know that such trust was very often misplaced. In recent years we have had serious systemic failures in, a number of organisations including the HSE, Fás, and the National Children’s Hospital Development Board to name just 3. Mistakes were made and people were let down. Irish Water had a very difficult start and lost the trust of the public almost from day one. People protested about water charges and the excessive costs of consultants. While individuals working in these organisations certainly do their best, corporate entities can fail. Last month there was a discharge of sewage effluent into Dublin Bay from the treatment plant at Ringsend. Apparently this was as a result of a storage tank failure. I understand that the incident happened at 9am on a Saturday morning but it took until Monday for the Environmental Protection Agency to be informed. I do not have sufficient trust in the systems in place to adequately protect the health and safety of our citizens in cases like this. Over 34,000 submissions have been made to An Bord Pleanála and most of these submissions are in fact objections to the proposal. The concerns of local residents must be listened to. The sheer size and scale of this project mean that it is totally contrary to the proper planning and development of this area.